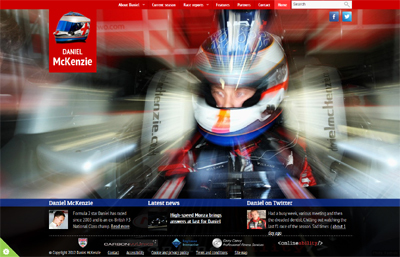 We’re proud to present the latest results of our work in the world of motorsports – the new site that we have built for F2 racer Daniel McKenzie is now live. Daniel, a talented former junior footballer who has been racing successfully in some of Europe’s top championships, has recently completed his first season in Formula 2, where he finished ninth overall. The site features imaginative use of race photography, a number of simple ways for fans to follow Daniel’s racing progress, a news feed and an attractive platform for marketing and sponsorship. We’re also delighted that Daniel’s car has been carrying Onlineability’s branding this summer as he toured Europe’s iconic racetracks – including Monza, Spa-Francorchamps and Silverstone. To learn more about our work in motorsport, visit this page of the site. Filed under Things we've done and tagged with Daniel McKenzie, Formula 2, motorsport.